The Dutch Scientific Council for Government Policy (WRR) has published its report on “Money and Debt, the Public Role of Banks” (Jan 17, 2019), confirming our approach to monetary system analysis and opening perspectives for monetary and banking reform. For the time being, the report is available in Dutch only. For now there is a > Summary on the IMMR website. - central banks do not control the quantity of money. Above is a BoE video on these questions. A paper in the BoE Quarterly Bulletin, 2014 Q1, deals with the same subject > Money Creation in the Modern Economy. David Graeber comments on the paper in The Guardian, 18 March 2014 > The truth is out. - asset inflation is not recognised as a target of monetary policy. For a résumé by Positive Money > click here. After the Bank of England also the German Bundesbank has taken the overdue and welcome step of explaining how banks today are pro-actively creating bankmoney (credits on giro account) and how these are fractionally re-financed by the central bank. All the same, the Bundesbank, too, skips a number of sensitive aspects such as, for example, the extreme fractionality to which banks are able to re-finance. Consequently, the impossibility of monetary quantity policy within the present bankmoney regime is completely blinded out, and the weakness of short-term base rate policy is downplayed. The publication sticks to the fiction of effective monetary policy by setting base rates. Believing in some elusive transmission mechanism, however, is no longer really convincing against the background of the explanations on the functioning of the present money system given in the same publication. Here is the Bundesbank publication as a PDF > The role of banks, non-banks and the central bank in the money creation process, pages 13–30, in Bundesbank Monthly Report, Vol. 69, No. 4, April 2017. In an 'Appendix' to this article titled > Remarks on a 100% reserve requirement for sight deposits, pages 30–33, the Bundesbank then explains why it does not think much of 100%-reserve banking. For a critical response > see the respective posting on the menu 'confronting criticism'. Biagio Bossone / Massimo Costa: The ‘accountancy view’ of money, The World Bank online, 21 May 2018. 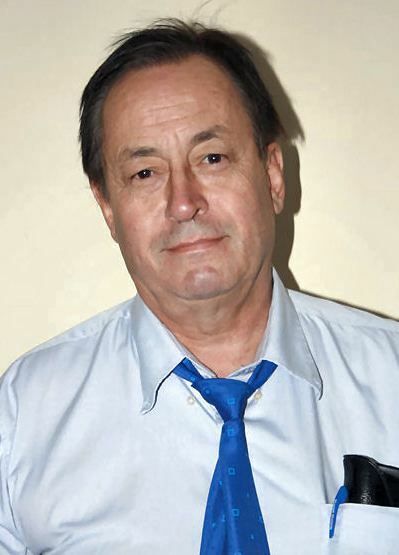 In an > open letter M. Schemmann criticises both the BoE and Bundesbank publications on money creation for not recognizing how fractional reserve banking is based on a fraudulent accounting practice, that is, accounting for loans to customers as a credit claim and liability 'out of nothing' rather than deducting the loan principal on the asset side from a bank's liquid cash or reserves. Martin Wolf, chief economics commentator of the Financial Times, explains in an interview with Rens van Tilburg, Sustainable Finance Lab, Utrecht University, what's wrong with the financial system. Most people still do not know that it is the banks that create almost all of our money, not the government or central bank. 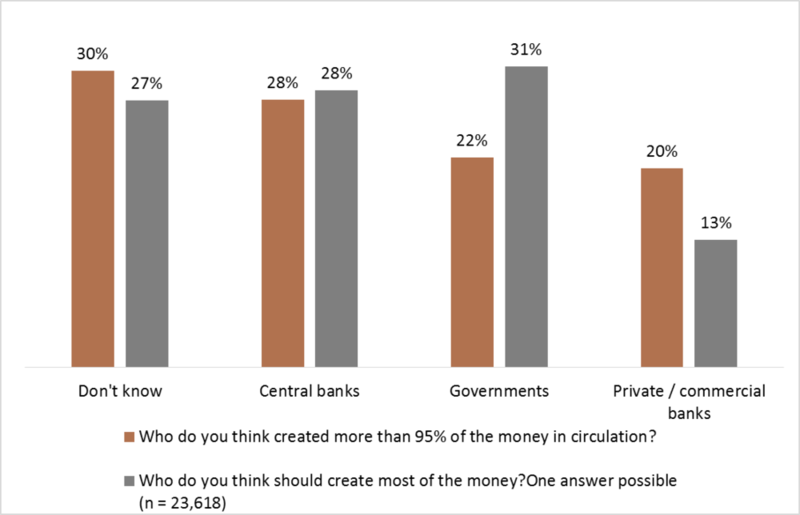 The majority of people in each of 20 countries clearly prefers the latter, 87% do not want the banks to be money creators, as revealed by a representative > international survey by Motivaction and Sustainable Finance Lab, Utrecht University. Something similar applies to British MPs (and, presumably, to parliamentarians in other countries too). 3/4 of them believe money comes from the Bank of England rather than the banks. 2/3 don't believe that banks create new money (additional deposit money) when they extend credit. And most MPs erroneously believe that bank credit goes to the real economy while in actualy fact the lion's share of new credit feeds non GDP-contributing finance > Dods MP Poll for Positive Money. Anshu Jain, ex Co-CEO of Deutsche Bank, apparently thinks of his monetary institute as a nonbank savings and loan association; or as a mere investment trust. He believes in the loanable funds model of banking, as if we already were in a sovereign money system. In this video, H.Scharpf raised the question. Positive Money Video on: Where does money come from? Who creates it? Who decides how it gets used? •Mark Joòb explains the dysfunctions of the present money system > The Sovereign Money Initiative in Switzerland, World Economics Association, Newsletters, Vol. 4, No. 3, June 2014. • Steve Keen > The Debtwatch Manifesto tackles, among other things, the urgent problem of debt deflation. • Sensible Money, Ireland, on > How Banks Create and Destroy Money. "Every loan, overdraft, or bank purchase creates a deposit, and every repayment of a loan, overdraft or bank sale destroys a deposit." Right Honourable Reginald McKenna, Former British Chancellor of the Exchequer and Chairman of the Midland Bank, 1924. What is responsible for the crisis? Lord Adair Turner, then Chairman of the UK Financial Services Authority, in a speech to the South African Central Bank in 2012.